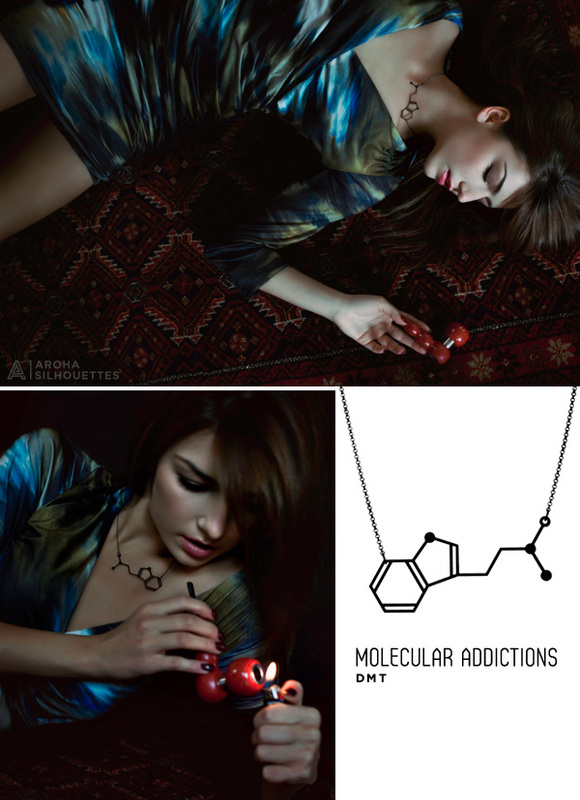 Regardless of your addiction of choice ~ be it Caffeine, Chocolate, MDMA, Nicotine, THC, or DMT ~ Aroha Silhouettes latest collection Molecular Addictions has you covered. Each of the necklaces are made of strong lightweight stainless steel that has been finished in a smooth matte black powder coating with gunmetal chain and findings. Take a peek at Tania’s new collection with photography by Kelly Jill on the next page! 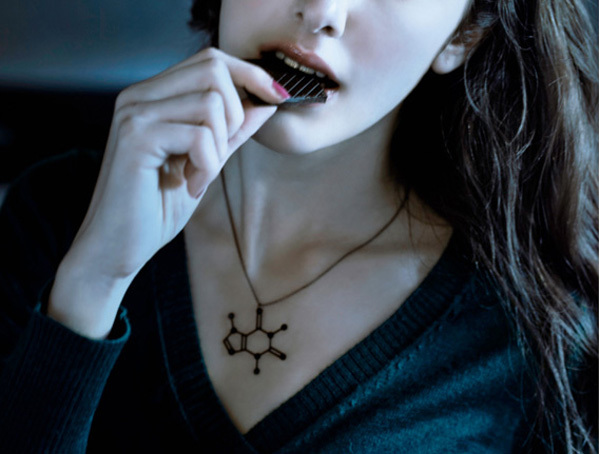 I thought i was losing my mind at first ~ but because of the way the chocolate and caffeine molecules simplified, they end up seeming the same… so you can claim either/both when you wear it! 2 addictions for 1! where can i buy these pictures??? this is absolutely brilliant! as a self proclaimed and socially recognized caffeine addict, I feel this is absolutely perfect! If there was ever a need for a piece of jewelery, it is felt for this! To distinguish between the caffeine and ‘chocolate’ molecules, you should remove the bar representing the H-N bond on caffeine, since in all other instances, you don’t represent a hydrogen bond. This is so good! Love it! To wear chocolate ‘round my neck… I’m in love!